A friend from college liked to say that Canada is more of a salad bowl than a melting pot. I wasn't sure what he meant by this at the time, but I finally understood years later when I moved to Vancouver. The neighborhood I moved to, Kitsilano, was unlike any I'd ever encountered in the States. It was centered on a street portentously named Broadway, and this was, predictably, a wide, busy thoroughfare. What was odd to my urban American sensibilities, though, was the tiny scale of the buildings and shops lining this major artery. There were a few big chain supermarkets and fast-food outlets, but the vast number of businesses along Broadway were small, quirky and family owned. Kitsilano was walkable and wonderful. There was a Safeway supermarket only a block from my place, but I discovered it was cheaper and way more fun to shop like the locals: I'd buy my vegetables and fruit at a little Chinese-owned produce stand; my coffee, spices and pasta at another Chinese-owned grocery just down the road; and my cheese and other dairy products at a Greek-owned grocery that always had the freshest feta and house-made yogurt. For treats, I could go to a tiny, well-stocked wine shop; an old-school Italian delicatessen and bakery, or a terrific Malaysian hole-in-the-wall that made succulent Hainan chicken rice and laksa noodle soup. While strolling between these shops, I'd peek into the numerous Greek bakeries scattered throughout the neighborhood, all featuring unfamiliar but beautiful little pastries and cookies, and around Easter, big braided wreaths of bread studded with bright red hard-boiled eggs. On Saturday mornings, when I did my weekly grocery run, the tables at these bakeries were filled with old men in porkpie hats, conversing energetically in Greek over coffee and pastries. Occasionally, one would bark out an order to the person behind the counter, who was usually hip-looking and young enough to be one of the students I taught at the university -- and this hip young person would answer back deferentially in Greek. Walking into any of these places was like visiting another country: The sights, smells and language spoken in each of them were distinct. Of course, I had shopped at ethnic markets and bakeries of every sort back in Los Angeles, where I grew up, but I'd never seen so many, representing such a diverse range of cultures so close to each other and so vibrantly integrated into the greater community. People young and old spoke to their compatriots in Greek or Cantonese and to everyone else in fluent English. And Anglo-Canadian customers at these little shops were perfectly at ease with this. Nobody ever asked the Greek cheese-maker where the Kraft singles were. Nobody ever shook a fist at one of those old men in porkpie hats, yelling, "This is Canada! Speak Canadian!" Back in Los Angeles, entering an ethnic grocery could be a fraught experience. Shopkeepers and regular customer sometimes seemed to resent or distrust outsiders. Despite being Chinese, even in Chinese markets I'd get the cold shoulder because of my near-nonexistent Chinese language skills. But on my weekend forays through the little shops of Kitsilano, I had no such worries. If I asked dumb questions about some basic Greek or Indonesian food product, someone would politely answer them -- in English. And this kindly soul would usually make a sale. At first, I merely marveled at this alien social dynamic and assumed it was a happy quirk of the neighborhood. But it later dawned on me that the cheek-by-jowl Chinese and Greek markets of Kitsilano and the welcoming attitude of local shopkeepers embodied my Canadian friend's vision of his homeland as a grand tossed salad. Each immigrant culture proudly contributed its unique color and vision to the Canadian landscape, while remaining comfortably distinctive – and comfortable with the cultures and mores of its neighbors. Later still, I realized why I sometimes got that weird treatment in ethnic markets back in the States: It wasn't that the owners and regulars had anything personal against outsiders. It was that they feared their cultural distinctiveness would be lost forever in the American melting pot. And they decided -- wrongly and regrettably -- that the only way to keep what was precious to them was to keep everyone else at bay. I've thought often about those little shops in Kitsilano since moving away, and I miss them still. Of course, Canada is not without ethnic tensions of its own, and the U.S. has its share of thriving multicultural communities. My current hometown is one of these. But I've never been able to find a place here where I could buy handmade baklava and freshly pressed tofu and gai lan within walking distance of each other, with the hum of Greek and Cantonese conversation in the background. One of the things I miss most about Kitsilano is the huge number of places where one can sate a craving for sweets. In honor of my old neighborhood, I've engineered a love child between Greek baklava and Chinese dessert dim sum, inspired by Kitsilano's two dominant food cultures. It has the structural bones of a classic Greek baklava (crunchy layers of buttery phyllo dough drenched in a spiced syrup) with a classic sweet dim sum filling of peanuts, coconut and sesame. It's the type of little sweet that is often offered to visitors in both Chinese and Greek homes. And in both cultures, it would be the height of rudeness to turn it down. First, make the syrup: Combine all ingredients in a heavy saucepan and bring to a boil. Remove pan from heat as soon as the mixture starts to boil. Do not allow it to reduce. When the syrup is cool, transfer it to a storage container and put it in the refrigerator. The syrup needs to be cold when poured over the cooked baklava, so should be made ahead of time. Make filling: Put all ingredients into a food processor and pulse until the nuts and coconut are finely chopped, but not pasty. Set mixture aside until you're ready to assemble the baklava. Assemble the baklava: Grease the baking pan or cookie sheet. Carefully unroll the phyllo dough, keeping it covered as you work so it doesn't dry out and become brittle. Keep the butter warm and liquid as you work. Place a sheet of phyllo in the bottom of the greased baking pan. Smooth it out to remove any wrinkles, and brush its entire surface with melted butter. (The brand of phyllo I used came in sheets that fit a 9½ x 14-inch pan almost exactly; if your sheets are larger, cut them to fit.) Repeat this process until you have 10 layers of buttered phyllo. When layering the phyllo sheets, try to avoid getting air pockets between the layers. Sprinkle 1/3 of the filling evenly over the 10 layers of buttered phyllo. Top the filling with a sheet of phyllo, brush the sheet with melted butter, then top with a second sheet of phyllo and brush that with butter as well. Repeat steps 7 - 8 once. Sprinkle the remaining 1/3 of the filling evenly over the phyllo layer, then top with 5 sheets of phyllo, buttering each sheet as you go. Freeze the assembled baklava for 10 minutes. Meanwhile, preheat the oven to 350 degrees. When the baklava is partly frozen, remove it from the freezer. Using a serrated knife, trim the edges and score it into 2-inch squares, cutting through all layers of phyllo. If desired, score each of the squares into two triangles. Bake the baklava until the top layer is golden brown, about 50 minutes. 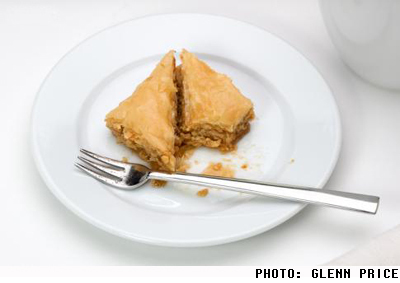 While the baklava is still warm, pour the cold syrup evenly over it so that all pieces are covered. Allow the baklava to cool before serving.